Journal of Toxicological Analysis is a peer-reviewed scholarly journal that analyzes toxicity that may occur from different sources like environmental, medicinal, clinical, food borne, drug related, nanotoxicity etc. Journal of Toxicological Analysis thus cater to the needs of the clinical practitioners like forensic specialists, environmentalists, chemists, technology developers, food processors, medical practitioners, academicians and students. 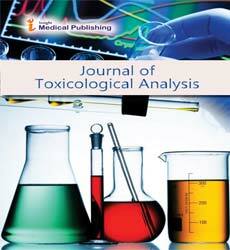 The journal focuses on a broad category of topics within this field, including Analytical toxicology, Drug toxicity, Nanotoxicology, Biomarkers of toxicity, Computational and predictive toxicology, Systems toxicology, Environmental toxicology, Clinical toxicology, Food toxicology, Forensic toxicology, Aquatic toxicology, Ecotoxicology, Entomotoxicology, Environmental toxicology, Occupational toxicology, In vitro toxicology, Medical toxicology, and Toxinology. Drug toxicity is also well known as drug intoxication. It causes abnormal death. Drug toxicity normally occurs by the incorporation of different drugs. It results in breathing suppression, lowers oxygen levels and finally fatal. Drugs become toxins when they integrate with other drugs and thus causes chemical changes and causes side effects. Pyrethrins are the botanical and organic insecticides extracted from flowers that belong to genus family of chrysanthemum widely available in Africa, Australia. They mark their presence in products used at household especially those used on pets, controlling mosquitoes, for crop protection in agriculture, in treated clothing. Their mechanism of action to kill insects is mainly through paralysing the target insects by alteration of the nervous system functioning. Pyrethroids are chemical and synthetic insecticides with their chemical structures derived from those of the pyrethrins and their mechanism of action is similar to that of pyrethrins. They are combined with synergists to enhance the pesticidal properties of the final product. Analytical toxicology is the observation, identification, and measurement of foreign compounds (xenobiotics) in biological and other specimens. Analytical processes are accessible for a very wide range of compounds: these may be chemicals, pesticides, pharmaceuticals, drugs of abuse and natural toxins. Nanotoxicology is a subdivision of toxicology deals with the study of the toxicity of nanomaterials, which can be divided into those derived from combustion processes i.e. like diesel soot, manufacturing processes such as spray drying or grinding and naturally occurring processes such as volcanic eruptions or atmospheric reactions. Related Journals: Toxicology: Open Access, Research & Reviews: Journal of Pharmacology and Toxicological Studies, Journal of Clinical Toxicology, Journal of Environmental & Analytical Toxicology. A biomarker is a characteristic i.e. objectively measured and evaluated as an indicator of normal biologic, pathogenic or pharmacologic responses to therapeutic intervention. It can be either specific cells, molecules, genes products, enzymes or hormones. It helps in early diagnosis such as prevention of disease, identification of drug target and drug response etc. Related Journals: Research & Reviews: Journal of Pharmacology and Toxicological Studies, Journal of Environmental & Analytical Toxicology. Aquatic toxicology: Aquatic toxicology is the study of the result of produced chemicals and other anthropogenic and natural substances and activities on aquatic organisms at various levels of organization, from subcellular along individual organisms to communities and ecosystems. Aquatic toxicology is a multidisciplinary field which combines toxicology, aquatic ecology and aquatic chemistry. Related Journals: Research & Reviews: Journal of Pharmacology and Toxicological Studies, Journal of Environmental & Analytical Toxicology, Journal of Drug Metabolism & Toxicology. Systems Toxicology is the incorporation of classical toxicology with quantitative analysis of large networks of molecular and functional changes occurring towards the multiple levels of biological organization. Medical Toxicology is a medical arena concentrating on the identification, management and prevention of poisoning and other adverse health effects due to medications, occupational and environmental toxins, and biological agents. Related Journals: - Toxicology: Open Access, Research & Reviews: Journal of Pharmacology and Toxicological Studies, Journal of Clinical Toxicology, Journal of Environmental & Analytical Toxicology. Related Journals: - Toxicology: Open Access, Journal of Environmental & Analytical Toxicology, Research & Reviews: Journal of Pharmacology and Toxicological Studies, Journal of Clinical Toxicology. Field of occupational toxicology is the analysis of the adverse effects of agents that may be encountered by workers during their employment. The work environment has played a major role in the circumstance of adverse human health effects due to chemical and biological hazards for centuries. Related Journals: - Journal of Environmental & Analytical Toxicology, Toxicology: Open Access, Journal of Clinical Toxicology, Research & Reviews: Journal of Pharmacology and Toxicological Studies. Related Journals: - Research & Reviews: Journal of Pharmacology and Toxicological Studies, Journal of Environmental & Analytical Toxicology. In forensic entomology, endotoxicology is the study of toxins in arthropods that feed on carrion. Using arthropods in a corpse or at a crime scene, investigators can identify whether toxins were existing in a body at the time of death. This is an advance technique in forensic department. Related Journals: Toxicology: Open Access, Research & Reviews: Journal of Pharmacology and Toxicological Studies, Journal of Clinical Toxicology, Journal of Forensic Toxicology & Pharmacology. Ecotoxicology is the study of the consequences of toxic chemicals on biological organisms, specially at the population, community, ecosystem, and biosphere levels.Ecotoxicology is a multidisciplinary field, which combines toxicology and ecology. Related Journals: Toxicology: Open Access , Research & Reviews: Journal of Pharmacology and Toxicological Studies . Forensic toxicology is the use of toxicology and other section like analytical chemistry, pharmacology and clinical chemistry to assist the medical or legal investigation of death, poisoning, and drug use. Related Journals:Toxicology: Open Access, Research & Reviews: Journal of Pharmacology and Toxicological Studies , Journal of Clinical Toxicology , Journal of Forensic Toxicology & Pharmacology . Clinical toxicology introduced to the measurement and interpretation of concentrations of drugs and other toxic substances in human biological fluids for patient care. Food toxicology is a foremost consideration as in origin the food supply chain is becoming more multinational, and any impurity or toxic manifestation may cause serious, wide-spread adverse health effects. Related Journals: Journal of Clinical Toxicology, Research & Reviews: Journal of Pharmacology and Toxicological Studies.